Do you want to gain greater Catamaran knowledge? Just Catamarans broker Derek Escher will participate as a panelist in second annual Cruising World “Make Your Escape” workshop today (Friday, October 5th) at the Governor Calvert House in Annapolis at 3:15 – 4:00 PM. 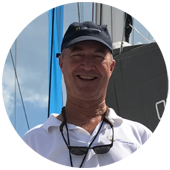 Derek will be on the panel entitled “Learning The Ropes.” The panel is designated to educate attendees about the many education options there are for learning how to sail, and how to sail catamarans in particular. The goal of this workshop this year is to help demystify Catamarans.